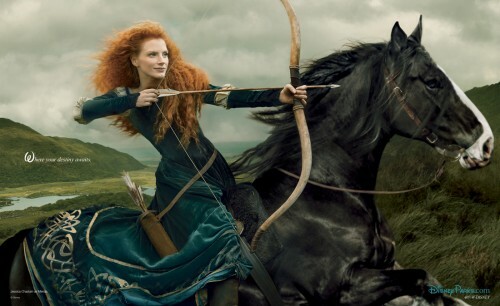 Earlier this week famed photographer of the stars Annie Leibovitz added Jessica Chastain to the list of celebrities she has featured in her Disney Dream Portraits series. The famous redhead portrayed Pixar’s first princess, also a redhead, Merida from the hit animated feature Brave. Today we get two exciting videos that take us behind the scenes of the photo shoot and reveal how the magic is made. (Love the fake horse in the shot above. Makes sense though.) Appropriately enough for the Scottish princess, the photo shoot took place in an area of Cold Spring, New York known as the Hudson Highlands. Photograph Annie Leibovitz’s collaboration with Disney Parks for the wonderful Disney Dream Portrait series continues. This time with the first every character from a Pixar film. Jessica Chastain portrays Princess Merida from “Brave” in this portrait entitled “Where your destiny awaits.” Chastain previously appeared in “The Help” a Dreamworks film distributed by Walt Disney Studios and for which she received multiple award nominations. I’m not sure they captured Merida’s horse correctly, but I do love the choice of subject for this photo. What do you think? 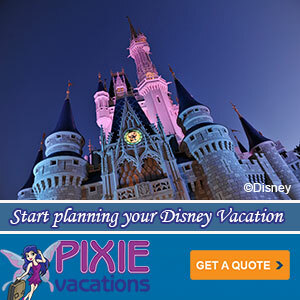 How did they do capturing the spirit of Merida?